Easter, the day of religious services and the gathering of family is approaching, so what have you planned this time. It's a glorious occasion to send warm and bright happy Easter cards to your loved ones. Reach out to your loved ones on this festival of hope and faith through happy Easter cards. Design special, unique and happy Easter greetings for your family and friends with greeting card studio software and cheer them up. Make your loves ones feels special by designing Easter cards for them on beautiful and colorful templates. We offer you greeting card studio software which has huge variety of greeting card templates with different themes for different occasions. You can pick different themes and templates for your Easter cards and design amazing greetings. Designing your own happy Easter greetings with greeting design studio is going to be an easy and fun task. 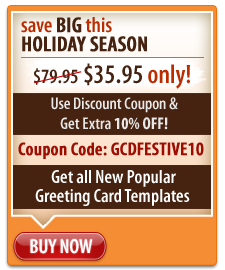 Greeting card studio software offers you the easiest way to make greeting cards for your family and friends. All you have to do is select the theme and template of your choice and make the greeting card. You can also write a personal message for your loved ones on the greeting cards or can add a photograph to add a special touch of affection. We have a mega save offer for our customers during when they can buy a super value pack of greeting card studio + all three template library. With this software package you can design happy Easter greetings and share them with your friends and loved ones. So buy your super value pack now at special discounted price.